Still on my non-National Lampoon’s European Vacation (mine is much funnier), I’ve been catching up on some flicks that I have missed out on. Now I don’t think that I let any of the best movies of the year fall through the cracks, but who knows, that’s why I’m taking precautions and catching up on ‘Movies I Missed’. Some will be praised and some will be slammed, and just maybe I will find a hidden gem somewhere. First up is the international spy thriller, The Debt, based on an the 2007 Israeli film Ha-Hov. Initially the story of The Debt seems quite simple: In 1965 three Mossad spies, Rachel Singer, Stephan Gold, and David Peretz (Chastain, Worthington, and Csokas; Mirren, Hinds, and Wilkinson play the present day versions) go into East Berlin to apprehend and bring back for trial one of the most notorious Nazi war criminals. His name is Dieter Vogel and during the war he essentially tortured countless human beings in bizarre experiments, masquerading as science. In the present day the mostly successful mission is in the history books and the three agents are regarded as heroes, especially thanks to a new book written by the daughter of the now separated Singer and Gold, but everything is not as it seems. The trio of ex-spies are harbouring a terrible secret. In a blending of past and present, The Debt revisits the old while trying to move forward with the new, but the past may prove to be too haunting for these agents to ever live what could be called a normal life. I had been browsing through IMDB or some other film website when I stumbled upon The Debt. It had received a lukewarm score of about 7/10, but that was more than enough to intrigue me. I’m very glad I took the time to track it down, as it turned out to be one of the most pleasantly surprising films I have seen in a long time. The real strengths of The Debt lie in three areas: the acting, the storytelling, and the script. There are many recognizable actors in The Debt, and luckily, they are recognizable for their acting talents, not only for walking down red carpets. The cast handles the material very well with Mirren, Wilkinson, and Chastain standing out for me. It should be said that some of the casting for the old and young versions of the same characters was a little questionable for the male agents; I thought that Worthington and Wilkinson looked more similar than Csokas and Worthington, likewise for Csokas and Hinds, but I’m sure the casting decisions were made regarding the type actor needed for the role, rather than who looks like who. Still, it does pull the viewer out of the story a little. The film flips back and forth between past and present so often that it could have been a jumbled narrative if it wasn’t handled with expertise. Despite all the jumps in time, The Debt manages to stay crystal clear throughout. I did not find myself forgetting character names, or wondering what was going on very often, unlike my recent experience with Haywire. Finally, I have not yet read the script (I intend to), but from what I saw onscreen, this is one of the freshest spy thrillers of recent memory with just enough suspense and violence, and more than its fair share of intrigue as the plot unfolds. 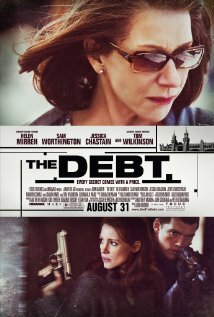 If you’re a fan of spy movies or thrillers in general then you owe it to yourself to check out The Debt, a film that’s very unlike typical Hollywood spy fare, refreshingly so.